It is perhaps fitting that the workers who joined for the very first Labor Day holiday in the 19th century had to lose a day's pay to participate. The holiday is a national tribute to the contributions made by workers to build America. 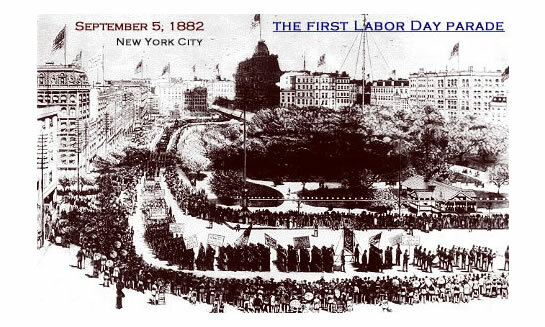 The event was a parade of unions and a picnic on September 5, 1882 in New York City. > Take this quiz to see if you really know what the holiday is about. The labor movement was growing at the time. An estimated 10,000 marchers and bands came out to support unions and spent the day picnicking, drinking beer and listening to speeches. At night, there were fireworks and dancing. Originally it was a state celebration, with New York, New Jersey and Colorado among the first states to approve legal holidays. Sen. James Henderson Kyle of South Dakota introduced S. 730 to the 53rd Congress to make Labor Day a legal holiday on the first Monday of each September. It was approved on June 28, 1894. > See the latest manufacturing jobs. This year also marks the 50th anniversary of the Job Corps, established by then-President Lyndon B. Johnson as part of the War on Poverty. Nearly 2.7 million students have gone through the job Corps, a residential education and training program for disadvantaged young people ages 16 – 24. Be inspired this Labor Day by the stories of This Built America.